A failure to imagine or recognize fisheries diversity in many policy settings undercuts progressive development, protection and support for the global majority of fishers and fishworkers who remain small-scale. Overlooking socioeconomic webs of diverse fishing practices, traditions, values and meanings, policymakers, managers and even scientists still often narrowly consider fisheries as arrays of capital and labor. 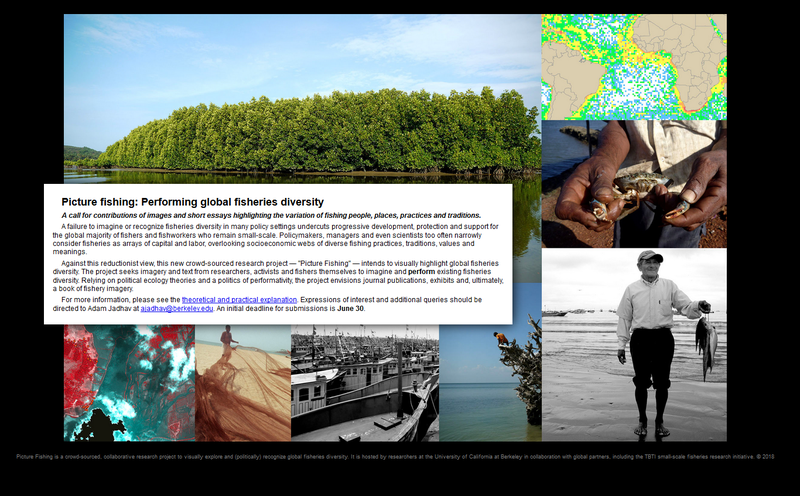 Against this reductionist view, Adam Jadhav, a PhD student at the University of California at Berkeley and TBTI member, has launched a crowd-sourcing research project aimed at visually highlighting global fisheries diversity. The project -- "Picture Fishing" -- seeks imagery and text from researchers, activists and fishers themselves to imagine and perform existing fisheries diversity. Relying on political ecology theories and a politics of performativity, the project envisions journal publications, exhibits and, ultimately, a book of fishery imagery. A full theoretical and practical statement will soon be available at www.picturefishing.com. Expressions of interest and additional queries should be directed to ajadhav@berkeley.edu. An initial deadline for submissions is June 30.